Pizza is well known as everyone’s favorite quick comfort meal. 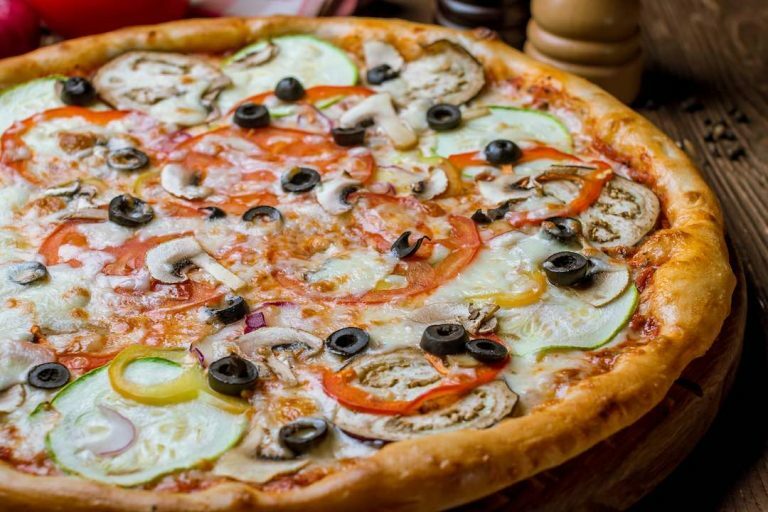 Vegan pizza is no exception to this and has evolved into a variety of styles from a quick frozen meal to a gourmet experience complete with seasonal vegetables and cultured nut cheeses. The future of vegan food is simple, plant-based cuisine highlighting plants while recreating the feeling and flavor that is evoked from traditional, non-vegan foods. The vegan pizzas of today do just that, from simple to complex, these recipes focus on vegetables, fruits, nuts, seeds, and grains to create all-star flavor combinations that will wow any pizza lover. The key to an exceptional vegan pizza relies on high-quality ingredients and recipes with delicious flavor combinations. We’re here to help you create your own recipes as well as learn some new ones to add to your repertoire. A good crust recipe is crucial for any pizza lover’s recipe book. Try making a few batches of crust on a lazy afternoon and freezing them for a quick, convenient and healthy dinner option. A flavorful tomato sauce is the key to an authentic traditional style pizza. Try making a large batch and canning it or storing it in your fridge for the week, it’s a great excuse to eat more pizza. The right kind of vegan cheese can transform any pizza from blah to incredible. It’s a good idea to experiment with cheeses and vegetable combinations to see what you prefer. The stars of the plant-based diet, vegetables add nutrients, color, texture and flavor to your vegan pizzas. Vegetables like mushrooms, onion, tomato and broccoli are classic and always a good choice while more infrequently used ones such as beets, garlic scapes and pattypan squash can add a unique twist. While dreaming up your new pizza combinations, we’ve created a few of our own and found some online to inspire you and delight your taste buds. Throw all items into a blender and blend until smooth. If not using a high-speed blender, soak the sundried tomatoes in warm water for an hour prior to making. Drain the water and use. In a food processor, add the sunflower seeds and salt and process until smooth and almost flour like. Add in the garlic and process until broken down. Add in the lemon juice a tsp at a time and process until crumbly. 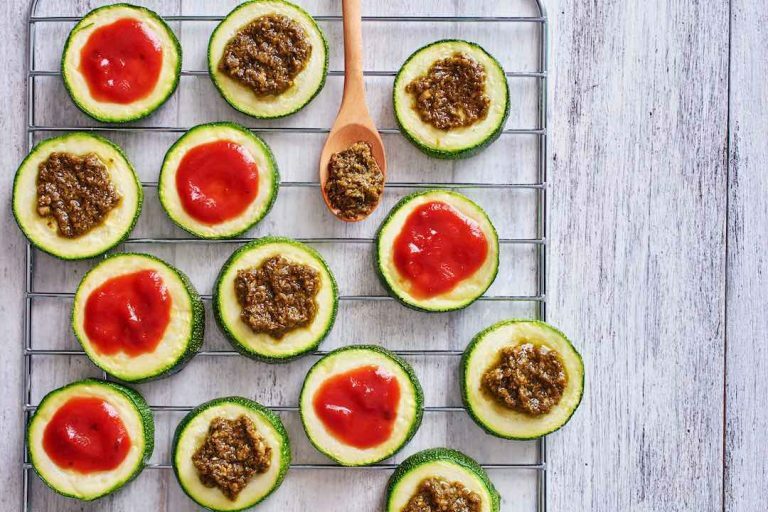 To assemble pizza bites, add a half tablespoon of marinara sauce to a zucchini round. Top with half a tablespoon or more of cheesy crumbles. Add oil, garlic and basil to pot and heat up. Add in flour and whisk until dissolved. Whisk in milk and cheese until dissolved. Continue whisking and bring to boil and whisk until thick. Set aside to cool. Mix together dry ingredients. Add in oil and water, adding additional tablespoons at a time until you reach a doughy consistency that holds together and doesn’t leave much residue on hands. On a baking sheet covered in parchment paper, flatten or roll out into a large circle. Bake on both sides until firm to touch (10-25 min at 400 degrees depending on how thick it is). Thinly slice potatoes, a mandolin works well. Lay on baking sheet and spray with oil. Sprinkle with salt and pepper and bake at 400 degrees until browning. Once crust has cooled spread the white sauce evenly. Add potato slices around the outside moving inward in layers just overlapping on the edges. Put into oven for additional 5 minutes. Let cool and enjoy! Chocolate covered Katie Clearly excels at more than just desserts. Cauliflower crust is all the rage and she managed to make a vegan one with only 5 ingredients! It’s easily made gluten-free and she reports that readers have had success with almond flour, so really, it’s a must try for any vegan! This is the ultimate veggie pizza, loaded with bell peppers, mushrooms, onions, olives and zucchini. This every kind of veggie pizza is the ultimate go-to pizza recipe to help you clean out your fridge while also satisfying your pizza craving. This simple pizza from minimalist baker has a classic pizza feel with few ingredients. It only requires you have crust on hand or bought and a simple Parmesan recipe to be made then you are well on your way to a deliciously easy pizza night. This deep-dish pizza is the kind of vegan food you think about for weeks after you make it. This pizza is made entirely from scratch, requiring some forethought to create it or a free afternoon. The cornbread crust topped with a homemade sauce, melty cashew mozzarella and broccoli and spinach will leave you speechless. And wanting a second slice, or three. This pizza has all the flavors and textures you could possibly want. Tomato, cheesy pesto, fluffy ricotta and crispy kale. With such a variety of flavors and textures, it is surprisingly quick and easy to assemble. These makes one small pizza for two, so considering doubling the recipe if you’re serving more people or have a hearty appetite. Transforming the classic Caprese salad into a pizza was a genius idea we can get behind. This pizza comes together rather quickly with basic ingredients and can satisfy both simpler and more refined palates. The combination of balsamic, garlic, basil and tomato will leave everyone satisfied and asking for more. BBQ on pizza is a modern day classic, and this cauliflower in place of chicken version is to live for! The marinating of the cauliflower is the longest step, but it is otherwise easy to assemble. Dip your slices in a vegan ranch dressing and you’ve got the best game food possible. What happens when you combine spinach artichoke dip with pizza? Pure magic, that’s what happens! This recipe is so simple to make and will quickly establish itself as one of your frequently used recipes. 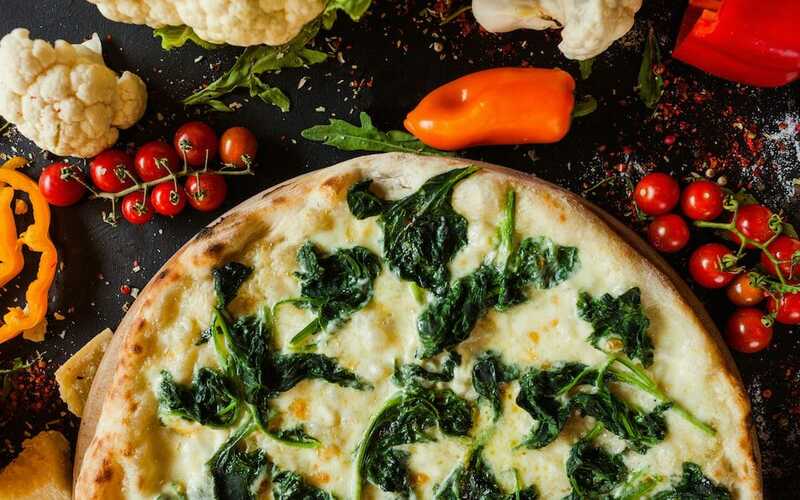 Whether you consider yourself a whole food vegan or a junk food vegan or a little bit of both, this recipe list is sure to please your palate and inspire you to create new and exciting vegan pizza combinations. These recipes are healthy enough to enjoy weekly, if not nightly, and delicious enough to share with everyone you know, regardless of your diet. So please, do yourself and everyone you know a favor and try out a few of these vegan pizzas.